In "Proof" by David Auburn, Catherine must establish the authorship of a mathematical proof found in the office of her brilliant but troubled father. The return of her estranged sister and a burgeoning romance with her father's former student complicate her pursuit of the truth. Christian Parker directs the compelling Tony Award-winning play at Merrimack Repertory Theatre in Lowell from March 21-April 14. 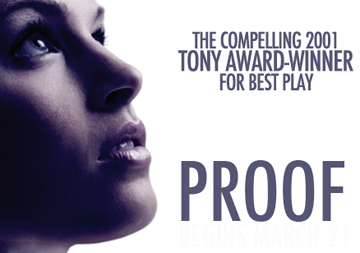 "Proof" will feature Keira Keeley, Michael Pemberton, Colby Chambers, and Megan Byrne. This marks Megan Byrne's returns to the MRT stage, while Keely, Pemberton, Chambers, and director Christian Parker are all making their MRT debuts. Parker, a native of Andover and now Associate Artistic Director of the highly-regarded Atlantic Theatre Company in New York City, commented: "I have a long history with 'Proof'. David Auburn has been a friend of mine for years, and I was among the first people to read the play when he wrote it. I advocated for its production at Manhattan Theatre Club and had the great fortune to serve as the dramaturge on the original production when MTC did it and moved it to Broadway." He continued, "I always knew that the play would have really wide appeal. It's simultaneously a throwback to the great well-made American family plays of the mid-20th century and a really contemporary look at what we inherit from our parents and how we embrace or neglect the essential elements of who we are. The play is smart, funny, and presents a fascinating puzzle at its core. I am so thrilled to have the opportunity to return to this play with a killer cast at MRT's beautifully renovated theatre. It's the first time I've worked professionally as a director so close to where I grew up in Andover, so it's especially exciting to be doing so with a play I know so well, and love so much." David Auburn is the recipient of the Guggenheim Foundation Grant, Helen Merrill Playwriting Award, and Joseph Kesselring Prize for Drama. His other plays include: "Skyscraper," "Fifth Planet," "Miss You," and "The Next Life." March 21 - 7:30 p.m. Patrons may purchase tickets for $5, cash only, at the Box Office from 4:30 to 7:30 p.m. There is a limit of 2 tickets per person. Following the performance, there will also be a Director's Dialogue, where the director and designers field audience questions and describe how the play was staged. March 24 - 7 p.m. Audience members are invited to join Merrimack Rep's staff and cast after the show in raising a glass of champagne to celebrate the opening of the production. March 27 - 2 p.m. Patrons are invited to enjoy complimentary cookies and coffee in the lobby before the show, courtesy of Brew'd Awakening Coffeehaus. March 27 - 7:30 p.m.
Lowell residents may purchase tickets for $10 at the box office from 4:30 to 7:30 p.m. Proper ID is required with a limit of 2 tickets per person. March 28, April 4, and 11 - 7:30 p.m. Audiences are invited to stay after the performance to learn the inside scoop and chat with the actors. For tickets and information, stop by the box office at 50 E. Merrimack Street in Lowell, call 978-654-4678 or visit MRT.org.